There have been dozens of posts made over the last few months reminding everyone to nominate their favorite Mover and Shaker from libraryland for the annual Library Journal supplement. I myself am in the midst of polishing my M&S nomination for submission before the deadline on Monday November 10th, so I thought while everyone was in nominating mode I would post a reminder that nominating season need not end on Monday! There are lots of ALA professional recognition awards that you can nominate your colleagues and institution to win — and many of the awards given by ALA have a December 1st deadline, giving you three weeks to put together your nomination! … to honor an individual library, library consortium, group of librarians, or support organization for innovative planning for, applications of, or development of patron training programs about information technology in a library setting. Criteria should include the benefit to clients served; benefit to the technology information community; impact on library operations; public relations value; and the impact on the perception of the library or librarian in the work setting and to the specialized and/or general public. I know, for a fact, that there are many libraries with innovative, forward-thinking and amazing technology-focussed programs that are deserving of this award, so step forward and nominate yourselves or your colleagues. 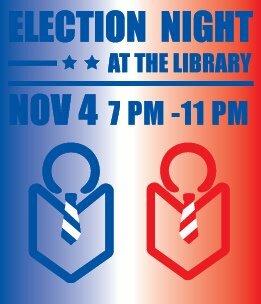 Princeton Public Library will be hosting an Election Night at the Library event for the third time tomorrow night. The library has always been open regular hours on election days and starting in 2004 we decided that as the “community’s living room” we were the perfect venue to host a non-partisan, family friendly election return event. We serve food and drinks, have political commentary, watch the returns on multiple screens, and stay open late — generally until 11 pm, but the year of the hanging chads we stayed until after midnight. Leslie Burger hosts the event and Ingrid Reed of the Eagleton Institute provides the commentary. It really is a wonderful way to spend election night and a great way for the library to prove its value as a Third Place. I started looking around to see if this idea had caught on at other libraries and I did find that Tigard Public Library in Oregon will be hosting an Election Watch 2008 event and that Towson branch of the Baltimore County Public Library will also be doing an Election 2008: Returns after Dark event. I am sure that there are other public libraries hosting events, if so please comment here and let us know what you are doing! I was somewhat surprised, however, during my quest to find other library election parties to also discover that many, many public libraries close on election day. I was a little baffled by this, to be honest, especially since Princeton Public Library has always been open and it is the only public library that I have worked at since emigrating from Canada. At first I assumed that some libraries closed because they are polling places. That turns out to be partly true, but it seem that many more close because it is consider a legal holiday in many states, including New Jersey (thanks Wikipedia). Should libraries remain open on election day and provide a non-partisan forum for their community to gather and participate in watching returns — or should they close in honor of the occasion? I obviously side with the former (even though I am not able to vote, yet) but I am sure there are other viewpoints and I would love to hear both sides.